When the Savior comes again, He will come in power and glory to claim the earth as His kingdom. His Second Coming will mark the beginning of the Millennium. For those who are wicked, this will be a fearful and mournful time. Yet for those who are righteous, it will be a day of great peace and joy. There is a reason that things happening in the world are changing and they will continue to change even faster, but it is all leading up to this glorious event that will usher in the Millennium. This is an important truth for our children to understand. Teach these truths through scripture, scripture stories (Ten Virgins in Matt 25), 10th Article of Faith, and your own personal testimony. Use pictures and visuals. You can even describe how you will feel when you see Him. What will you say to Him? How will it be to live with Christ as our King? Help them create their own story. Everyday can be a Countdown to getting closer to SOMETHING AMAZING IS COMING!! But to get to this AMAZING EVENT, some things will need to happen first. If we are prepared and obedient, we don’t need to be afraid. Depending on the age of your children, you can go into this deeper or keep it light. Possibly make it a matter of prayer of how to present these things in a way that instills faith and not fear. However, you do want to talk about some of the things prophesied to happen BEFORE the “Great Day of The Lord”. Look in the scriptures for times that the Lord’s people faced emergencies. How did they handle it? What are some examples? Maybe even role-play or act out these scripture stories. Take a little bit of time and think about emergency scenarios that your kids might face. Then when you have some time with them (Driving in the car, at dinnertime, etc.) and you have their attention, talk about these possible situations in a non-threatening way. Situations like: Earthquake, Economic Downfall, Plague, Home Invasion, Car Crash, Chemical Attack, Power Outage, Tsunami, Flood, Big Storms, etc. One way to do this is to play the “What If” game when you are together as a family or even just one on one. It doesn’t have to be a long family discussion, even just short little talks are helpful. Aim to talk about these things at least once a week. I once got a book called “What Would We Do If…” by Shalmarie Bunker and Kim Osborne and we had fun as a family going over many various situations and what we would do. Some of the questions were things we hadn’t thought of before, so it really go us thinking. The book also shared how going over these scenarios actually bore fruit in real-life situations that they encountered. Their kids knew what to do. This is an excellent idea when it comes to emergency preparedness. Going over NOW, what we would do WHEN something happens will give a plan and focus for your whole family. Here are some ideas of questions, and I’m sure you can come up with many of your own. Our smoke alarm goes off? You are playing and you feel the ground start to shake? You hear the security alarm in our house go off? We had to evacuate our house quickly? We went on a hike and got lost? My friend/sibling falls down and it looks like a bone is broken? I’m woken up at night with the ground shaking and things falling down? I come home and can’t find mom or dad? Someone threatens to hurt me or my family if I tell something? I see an explosion or mushroom cloud bomb go off? The grocery stores became empty and are closed? There was a power outage that went on for days? We lost all our money? We are driving somewhere and our car breaks down with no one else around? You can talk with your child and go over options for each “what would we do if” scenario. Who knows, maybe your child will have better ideas than you! 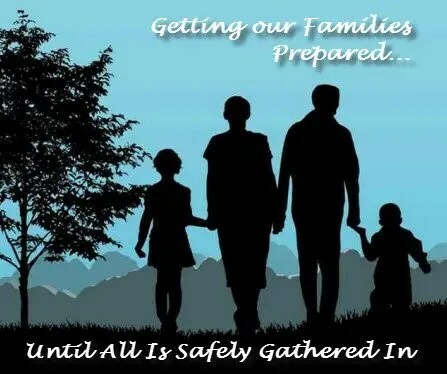 After going over the signs of the times and watching things that are going on now, it might feel great to organize your emergency preparedness kit as a family and let your kids be involved. Ask them what things they think you might need. Bring up different situations and ask what items your family should have on hand for that. Let them help pick out the flashlights, canned food, extra clothing, etc. for their kits. Here’s a list and video about making 72 hour kits. See our own previous blog post for images and ideas in building your own rolling first aid kit! What is muscle memory and why is it so important? Muscle memory is the act of doing a specific motor task over and over so that the process literally becomes part of the memory of your muscles through repetition. You do it already. Like brushing your teeth, typing on a keyboard, and making a sandwich; these are all things you do without even thinking, right? That’s because your muscles have repeated those movements until it is part of their memory. When we are in situations that are new and shocking, we typically do not have ANY muscle memory to fall back on to jolt us to action. This is why so many people sit in shock and do NOTHING right after a disaster or traumatic situation. Someone commits a crime while others just stand and watch, or people just sit dumbfounded in a plane or car right after it crashes not knowing what to do. Practicing what you will do in an emergency situation – and then teaching your kids to practice too, can actually be lifesaving when something does happen. This is why public schools do fire drills. This is why we should have practice drills with our family. When you see destruction and injury around you, if you do not discipline your mind, you might get faint, fearful or even freeze up altogether. The ZONE is where you push all those thoughts behind you and simply bring up a CHECKLIST of what needs to be done. You follow that check list faithfully without letting other thoughts and reactions come in your mind. If you react and freeze up, then you become another variable, instead of being part of the solution that can help. Getting in the ZONE and disciplining yourself to stay there can SAVE LIVES! Practice with your kids about getting in the zone. Describe an unpleasant situation, and then bring up your ZONE check list, and begin going over that. Kids can learn this even quicker than adults. Knowing what to do helps us not to become paralyzed in fear. House Fire – Practice a fire drill for when a fire alarm goes off. Practice the different ways to exit the home depending on where you are. Practice getting family pet out. Practice meeting at a designated location outside. Practice calling for 911 help. Home Intruder – Practice the response to an intruder in your home. Practice calling 911 for help (without actually calling of course). Practice ways to escape, hide, and/or defend yourself. Tsunami – Practice responding to the warning of a tsunami. Practice getting to higher ground or a designated spot. Nuclear Bomb – Practice first response to seeing or hearing of a nuclear bomb by getting indoors and below ground. Practice closing all windows and doors and turning off all air systems. Practice getting all food/water/emergency items (toiletries) in one place where needed. Practice if in a car and closing up all windows and vents. Home Quarantine – Practice setting up a home quarantine in the event of a plague breaking out. Practice sealing off an area of your home and putting “Home Quarantine” signs on your outside doors. Practice putting up plastic sheeting in a designated Clean Spot. Practice wearing protective gear when dealing with a sick person. Read more how to set up your own drills from the Preparedness Mama. Do your kids know how to survive without all their creature comforts? How do you think you would fare as a family right now, if the power grid went down through an EMP attack? Just thinking about that can bring up needed SKILLS you will need and your kids too! Camping trips are great time to learn new skills that can be helpful in emergency and survival situations. Below are some sample skills that we can teach our kids (and learn ourselves) during our family together times. Make a list of your own and begin working on them with your family this week! How to start a fire and keep it going. Here’s a list of 32 survival skills your child should know. And we get to be part of it either way!! It will be AMAZING on either side. What is something to fear, is the consequences of turning away from our Savior and Heavenly Father through our choices and actions. We do not want to be numbered among the wicked. It’s vitally important that we help BUILD the FAITH of our children. Build their faith in Jesus Christ, build their faith in the bright future that awaits them, and build their faith in choosing what’s right. We do this by staying close to the Lord ourselves and setting that example. Talk about the second coming of Jesus Christ. Show pictures and use visuals to stir the imagination. Share how you think it will be and how you imagine you will feel. What will I do when I see Him? I will kneel and honor Him, then give Him a big hug. Create a yummy story. How will your family be around Him? Do you see yourself being safe? GENERATE EXCITEMENT for the Second Coming!! When there is no story: FEAR WILL COME IN –> Create a story. When there is no excitement: FEAR WILL COME IN –> Show excitement. What if someone dies? That’s okay, dying is the last thing on my bucket list, right before I get to see loved ones in the Spirit world. Either way: Something AMAZING is coming! We will experience it wherever we are! Use music to build faith. Inspirational hymns, children’s primary songs, and Christian music. Practice watching for the signs and miracles. Have a countdown and be excited that each day you are “One Day Closer” to something Amazing! I hope you found something helpful with these four main areas of teaching our kids and preparing them for what is coming. So to recap: 1) Teach them about the Second Coming of Jesus Christ; 2) Go over the Signs of the Times and plan for what is coming; 3) Have Family Practice Drills – Develop Muscle Memory; and 4) Build Faith through Visuals, Music and Example. It’s an exciting time to be alive and I hope we can prepare ourselves and our children to be ready! This is great! Can’t wait to get it off to my family! Thanks!